Capable of handling loads of almost a tonne entirely safely, our 4mm 7×7 stainless steel wire rope is a perfectly practical option for various lifting operations. It is also durable and reliable thanks to the composition of the material itself, while being sold in any length you need. 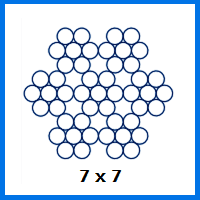 Why 4mm 7×7 stainless steel wire rope? The difference between our 7×7 stainless steel wire rope and the other configurations in the range comes in terms of its rigidity. 1×19 construction rope is comparatively stronger, 7×19 rope is more flexible, but this 4mm rope straddles the line between both assets. The 994kg load limit and the 9.75kN breaking force should also help to turn heads. Meanwhile the ability of the stainless steel to prevent corrosion forming gives it greater appeal in many circumstances involving outdoor use. Since we stock wire rope fittings and can build entire assemblies with the parts you need, our 4mm stainless steel wire rope can be easily enhanced in whatever way you wish. You can even use it to create wire rope slings, which can make it simpler to complete lifting operations of all types. You are in complete control when you order wire rope from Rope Services Direct. A quick call to 01384 78004 is all you need to get extra product info, quotes and advice on any wire rope issue. Our online email form is another option for prospective customers who are interested in what we have to offer. 4mm 7x7 Stainless Steel Wire Rope Overall rating: 5 out of 5 based on 6 reviews.